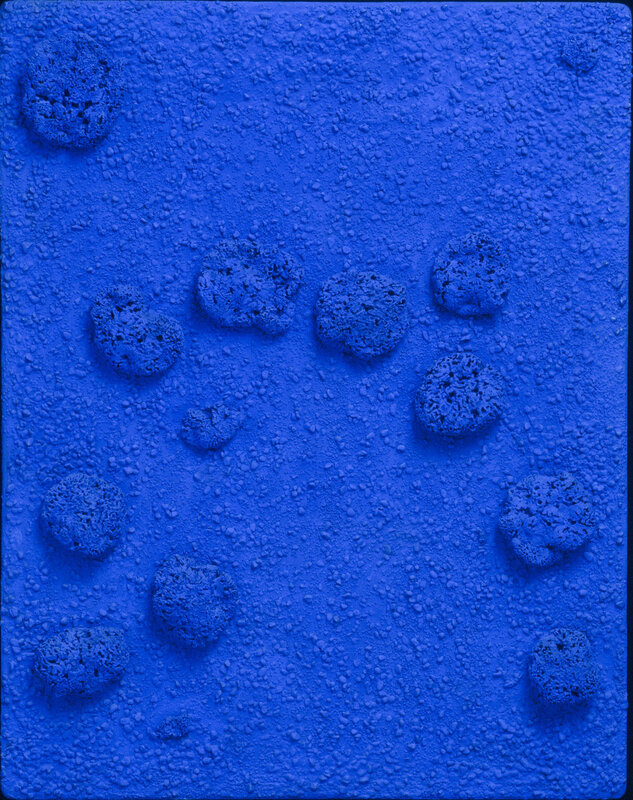 Blue: This particular shade of blue was called International Klein Blue (IKB), developed by Yves Klein in collaboration with Edouard Adam, a Parisian art paint supplier. Klein, disappointed after his colorful 1955 and 1956 exhibitions of oil paintings were perceived as a new form of interior decoration, determined that he needed to focus in on one color. Using ultramarine pigment and a unique resin binder, Klein and Adam developed this vibrant blue shade. Monochrome: The following year, in 1957, Klein held an exhibition called “Proposition Monochrome; Blue Epoch” that featured 11 identical blue canvases painted solely in International Klein Blue. A critical success, the exhibition launched a period of Klein’s career in which he experimented solely with the use of this pigment. Sponge: In the years following his first blue exhibition, Klein never strayed from IKB, but experimented with scale and texture. Here, he used pebbles, pigment, and sponges to create spatial and perceptual depth on the surface of the board and complicate the visual plane. Relief: This highlights one of the most significant aspects of the work—that the shadows cast by these relief objects create variance in the color of the painting.